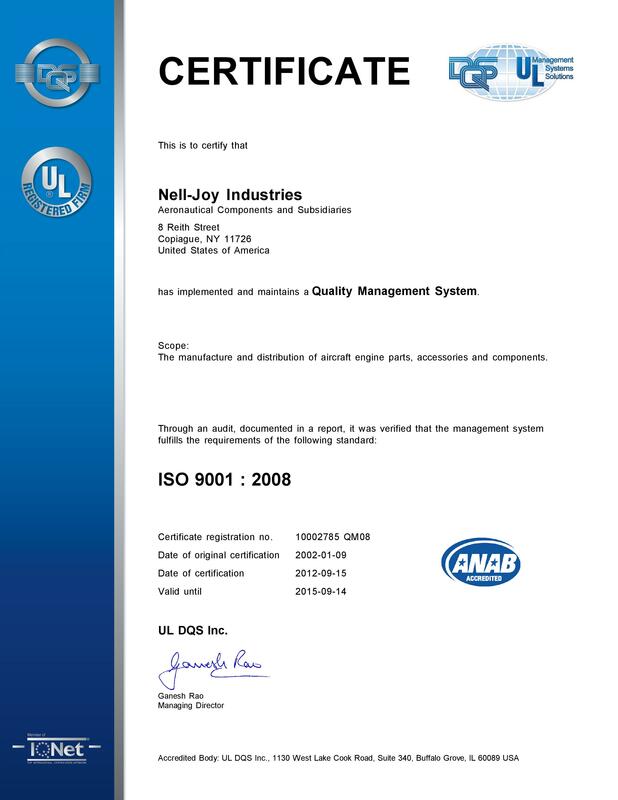 Quality Assurance Program ISO 9001:2008 The Quality Assurance program of NELL-JOY Industries is designed to ensure that the maintenance of product quality through self-assessment, process validation, and verification of processes at all stages of manufacture. The international body that governs our quality system is called ISO-9000. This international body is recognized worldwide as an indicator of effective and sound quality systems. 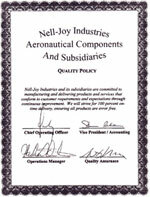 NELL JOY / Aeronautical Components received its ISO-9000 certification from UL (Underwriters Laboratory) in January of 2002. In June of 2009 we successfully completed our upgrade to ISO 9001:2008 and we are proud to comply with these international guidelines. Every associate of the company understands that as a manufacturer and supplier of parts for the aircraft industry, we must follow the ISO-9001:2008 international quality systems requirements no matter how they may affect our day-to-day working environment. Every associate strives for total customer satisfaction and realizes that each task we accomplish has a pronounced effect on our customer and quality goals. All associates understand what is expected of him or her to make certain that our products are the best in the world. The products that we produce are free of described defects, safe for the end user, and must meet customer expectations. Quality Policy Nell-Joy Industries and its subsidiaries are committed to manufacture and deliver products and services that conform to customer requirements and expectations through continuous improvement. We will strive for 100 percent on time delivery, ensuring all products are error free. © Nell-Joy Industries 2009. All rights Reserved.